She thought her home was being broken into and rushed into the pantry, locked herself in, and called the police, according to Carlson. Around 20 harassers were at the scene, where they also spray-painted an anarchy symbol on the driveway. Carlson was at Fox’s Washington office at the time. Now the police are investigating the so-called protest and vandalism as a possible hate crime, the Metropolitan Police Department told the Associated Press. The police report notes there were no arrests but officers confiscated several signs and list the incident as a “suspected hate crime” on the basis of “anti-political” bias. Far-left extremist group Smash Racism DC go to Tucker Carlson's house and harass his family. The department said that “defacing private property” is not an expression of free speech and the First Amendment. Carlson hosts one of America’s most popular cable television shows, with millions of viewers tuning in each night. He frequently supports President Donald Trump’s policies, including border security and combatting illegal immigration. Twitter eventually took down the videos and suspended the account. Carlson told Fox that the group broke his oak front door and that one of them was caught on security footage mentioning a pipe bomb. The couple has four children, none of whom were home at the time. 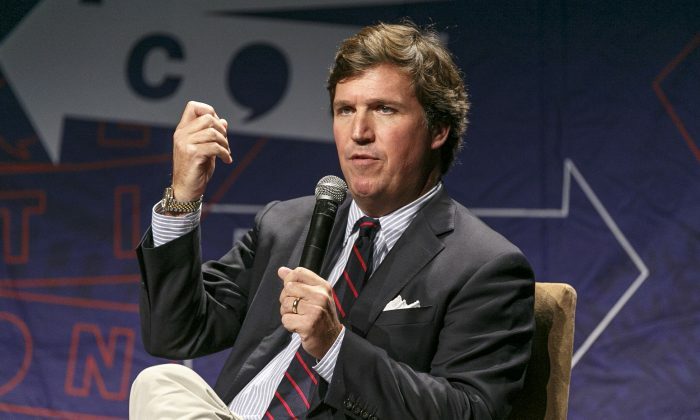 Carlson told Fox he doesn’t mind being confronted in public but told the Washington Post that this time the radicals had gone too far.